Our Pal Paddy modelling this season’s sensational ‘muddy dog’ look. Mud. It’s the bane of every dog loving household for months of the year, but just like vet bills, poop and hair on every surface bar the dog, it’s an inevitable part of sharing your life with a canine friend. That said, there are ways of minimising its disruptive influence: here are my favourite top tips. An obvious one perhaps, but if I had a pound for every time I saw an exasperated owner yell ‘NO!’ at their pooch as they galloped joyfully to the puddle or squelched belly deep into the black stuff I could give up work and write about dogs full-time. Dogs are dogs and therefore blessedly devoid of the worries that occupy our minds like whether their boss will accept ‘I had to hose down the dog’ as a valid excuse for being late to work or whether you’ll ever be able to get the kitchen floor clean again. If you don’t have time to deal with the mud, then avoid it. Take them on a longer street walk if you’re pushed for time, play with them at home, do some training or walk them later in the day, but please don’t expect to take the kid to the sweet shop and expect them to abstain in the interests of your agenda; it’s just not fair. When we took Bramble, our Springer Spaniel puppy for his first check-up, the vet told my mother to buy good wellies and a set of waterproofs. It was sage advice. Having the right protection from the elements turns a miserable walk into at least a bearable one. My wardrobe is now well stocked with all manner of weather and dog proof clothing. My only rule is that all outer layers must be washable because even if your dog isn’t a jumper, you can never guarantee that you won’t encounter an over-enthusiastic greeter at the park. Little Bear has soft fluffy Schnauzer fur that clings to mud and knots. Brushing it out is possible, but not much fun for him (or me) so in the winter his legs and tummy are regularly trimmed. It may not be the Schnauzer ‘look’ but I don’t care as long as he’s more comfortable. Both Little Bear and Annie have coats. Bear because he hates the rain and has fur that gets quickly sodden (at which point he shivers and refuses to walk) and Annie because she has arthritis and has a coat that takes forever to dry. We use their Equafleece coats most often because you can sling them in the washing machine, pop them on a radiator and they’re dry again by the next walk. I’m often bemused by people who won’t put coats on dogs. Maybe it’s a macho thing or a backlash against dressing dogs up as if they’re dolls, but for me it’s both kind and practical. 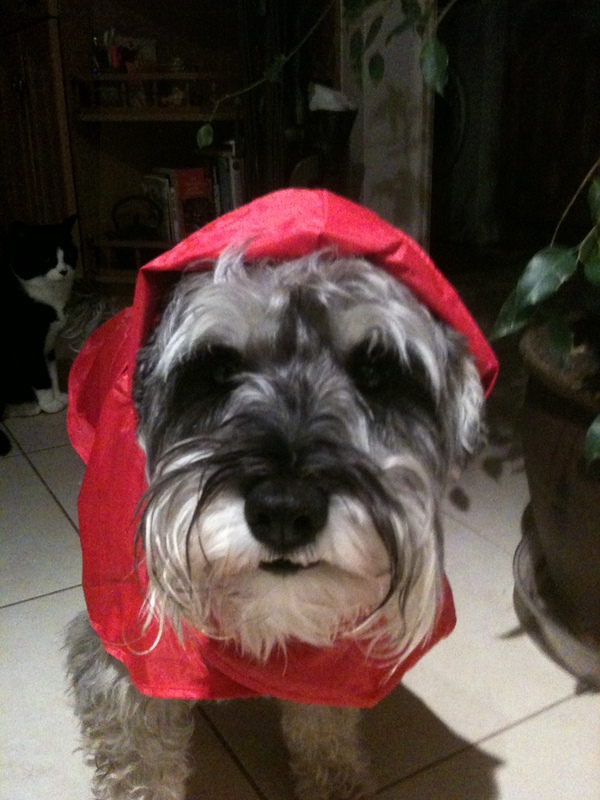 If it’s cold and wet enough for you to have a coat on, chances are your dog would benefit too. You can even get waterproof onsies to cover their legs as modelled by the adorable Louis and Archie. Mud? What mud? 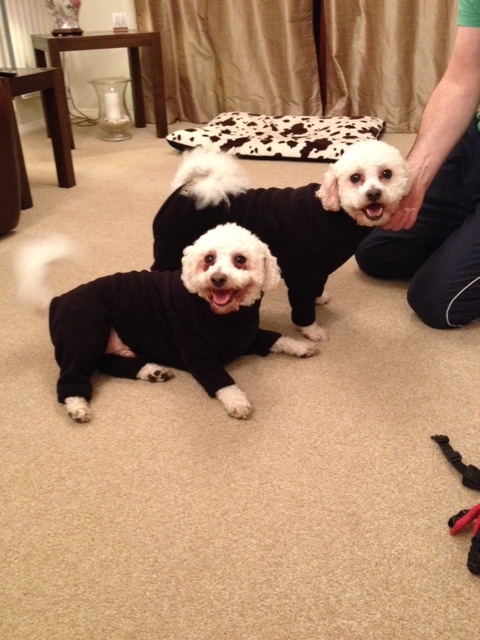 Bichon brothers Louis & Archie in their mud proof onesies. Okay, if I could do this I’d patent it and make millions, but there are practical ways of minimising the impact on your home. As I wrote in my previous post, Dog seeks human, must love mud, I’m the idiot who chose cream tiles and white walls so when I’m wiping down paint work and the steam mop is working overtime on the floors, I comfort myself in thinking that at least it’s easy to see and remove this way. Admittedly, it’s a small comfort. Towels: A huge pile of dog towels is a must. A great way to reuse those that might have seen better days, in our house, they live in a basket in the garage ready for post walk rub downs. Once there’s a machine load they get a quick wash on a cool cycle, dried on the bathroom towel radiator and are ready for their next round. It’s a pain, but it would be more of a pain without them. 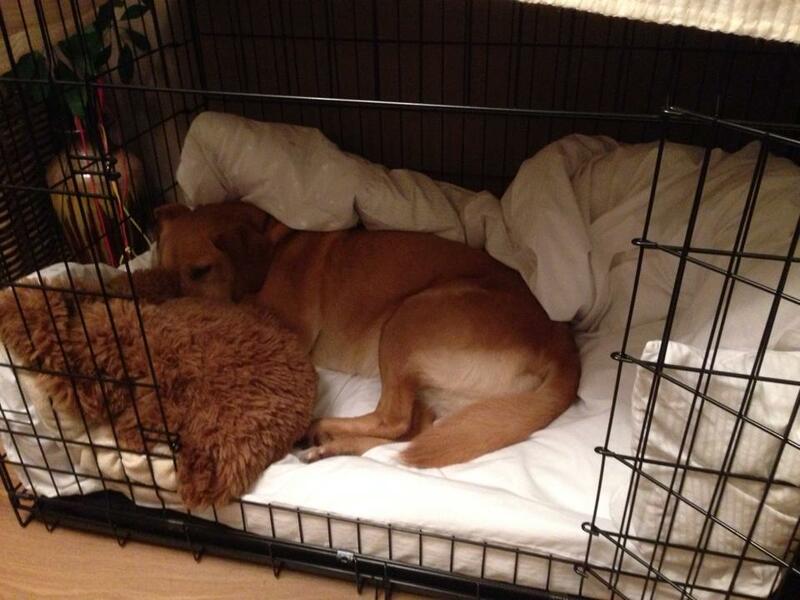 Bedding: The thing about good dog beds is the fact that they’re usually soft and comfortable. The way our two pull for home on a cold wet day leaves me in no doubt that they’re looking forward to snuggling up in their nice warm beds. Beds that will of course, be damp and covered in mud within minutes. So having washable beds and or bedding is a must. Little Bear and Annie love their crates. Each has a thick waterproof base pad topped off with a washable single quilt. They wash well and dry quickly which is absolutely essential. Containment: This may be stating the obvious, but restricting access to the rooms you’d rather not get muddy is one of the simplest ways of containing the mess. If you recall the Christmas Pedigree advert you’ll already have a nightmare scenario in your mind of what might happen (it’s very funny if you’ve not seen it) , but remember, humans are usually the ones with the power to close doors! Possibly my most important tip of all. Having dogs is a privilege and one of the great joys in life so try not to let a little mud and mess detract from all the good stuff. And next time your dog is ecstatically bounding through muddy puddles, try it out for yourself, you never know, you might just surprise yourself! 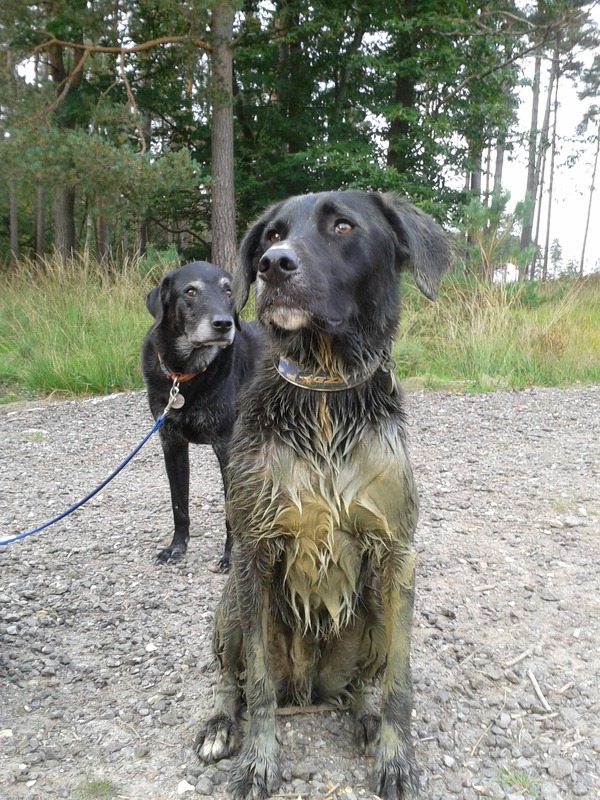 Do you have some top tips for dealing with muddy dogs? Do please share as a comment as I’m sure we’d all love some more ideas on how to manage the mud. Thanks!